16 - ounces 16 - ounces Enjoy our new Avocado & Citrus Foot Scrub. We created a wonderful blend of oils and Pacific Sea salt to exfoliate and moisturize your feet. 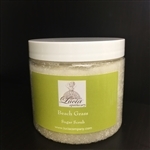 This scrub is so emollient, it can be used all over your body. Try our Avocado & Citrus Body Butter, a great compliment to our Foot Scrub. New! Moonstone - beautiful scent just like the Beach it is named after in Cambria! Limited Edition Gardenia Tuberose a perfect floral blend for the season - Enjoy! New Limited edition sugar scrub in the much requested Vanilla Pumpkin flavor Enjoy! New! 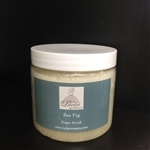 Sea Fig - you have loved it in a parfum, now enjoy it in body oil, scrub, and body creme! New! Beach Grass - Clean like fresh cut grass, enjoy! Finally, a gentle face scrub that will moisturize and leave your skin feeling soft and hydrated.